I take this route on purpose even though it costs me a bridge toll. Every morning, I get to see our river – the one John Hartford lyricized as “too thick to navigate, too thin to plow” - and to connect with it before a day at work. To be fair, it’s not always muddy. It goes from a deep green in the late spring to a lighter shade as the summer sun gets hotter. During the cold of winter, it’s a muddy brown. And we love it. 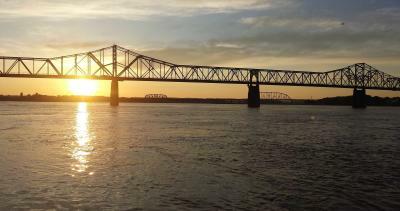 In all its powerful churning or reflective tranquility, the Ohio River helps define our personality in SoIN. It’s why this area was settled. 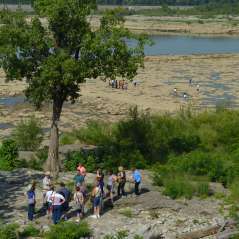 The Falls of the Ohio is the only natural obstacle along its 980 miles and caused early settlers to portage freight and people to safer waters below the rapids. Some stuck around. Today, it’s a source of water, commerce, destruction, recreation and inspiration to the 1.2 million residents of the area and our visitors. I grew up a “river rat.” Our family had a boat and spent time on the Ohio when I was still in a bouncy chair. We grilled and picnicked on the beach of 18-mile Island, water skied, swam, swung from ropes dangling from huge trees on the shore and cruised up and down the river day and night. More than 50-years later, I’m still out there. At night is when one of the most magical icons of the Ohio River comes out to play. 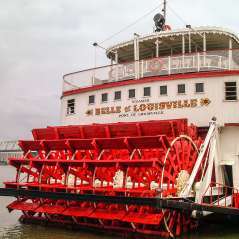 The Belle of Louisville, when it’s on a night-time cruise, lights up, and we can see it for miles upstream. The Belle at night invokes the image of a birthday cake floating on the water. She is approaching 104 years old and is still my favorite boat to watch for on the river. As comforting as it is to see her from the water, riding onboard is a gentle spin in a time machine and something you should try. From my office a few short blocks from the river, I can hear her perfect steam whistle and pitchy calliope announcing her daily excursion. When cruising season starts each spring, it means the days will be getting longer and the sun will be getting warmer, I know I’ll be able to see Louisville’s lady out for another year creating new memories.